Swathing has no clear advantage over straight combining for lodged canola. It often comes down to personal preference, but the following questions can help with your decision. How bad is it lodged? Light lodging can actually be helpful for straight combining as it can “knit” the crop and reduce whipping in the wind. Heavily lodged crop, especially if lodged in all directions, might be a better candidate for swathing. Taking time to swath it should reduce the time needed at combining — as long as it creates a nice even windrow. Is it a shatter tolerant variety? If yes, letting it stand may be the best option. How low do you have to cut? Swathing low to the ground doesn’t leave much stubble to hold the swaths in a wind and can limit air-flow through the swath. Swathing lodged crop can also leave a lot of bunches in the windrow. However, straight cutting low increases the risk of rocks going through the combine. How much time do you have to work on the crop? If you have enough time and help, you may want to take the swather into the crop rather than straight cutting to reduce the time and spread out harvest. If you straight cut all your acres and it turns out to be slow-going, will there be an issue getting everything off in a timely fashion? Perhaps a combination of both operations can spread out the workload and ultimate risk. Direction of attack. Swathing or straight combining lodged crop may require some trial and error to see what direction works best. Some prefer going perpendicular to the lean; some prefer going into the lean. Disease. 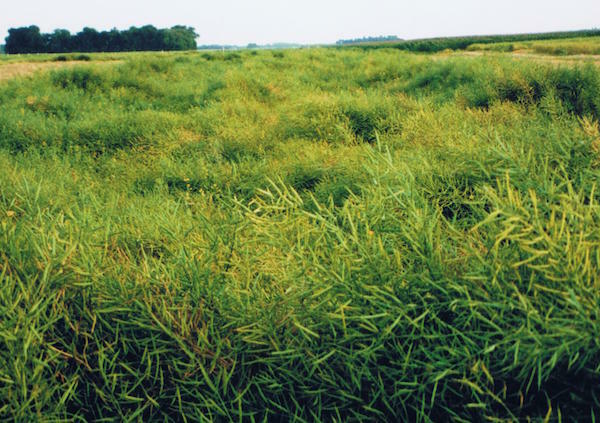 Canola that does not straighten up after lodging may develop higher levels of sclerotinia stem rot. This might be one exception where earlier swathing is better — for two reasons: (1) green pods can bend so can take the increased trauma of attacking a lodged crop and (2) sclerotinia stem rot can spread faster in lodged crop, so cutting early could make it less severe. However, by cutting early you guarantee a yield loss due to early swathing. So make sure the disease risk is there. And if disease is the cause, are these lodged patches going to yield enough to drive the harvest method decision? Reason for lodging. Are some fields lodged and others not? It could be isolated storm events, like hail or heavy rain. Or high fertility. Variety. Plant size. Note anything risk factors that could be improved next year with different management decisions.